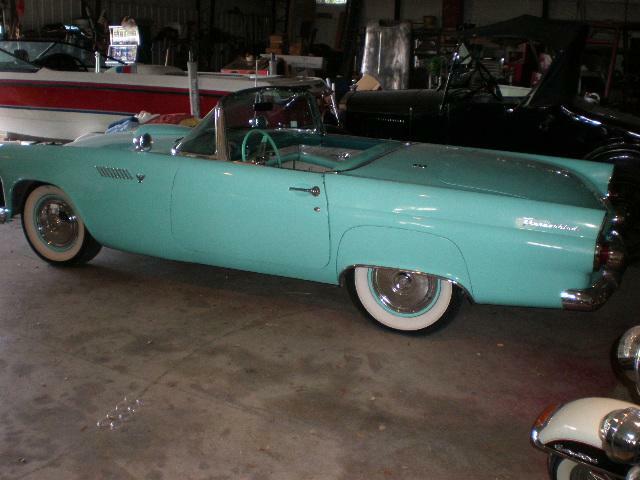 1955 T-Bird Roadster, This is a very nice driving car that looks like a million bucks from 20 feet. The paint was done in 1972 at a cost of $144 plus $27 for materials. This reciept along with hundreds more going back to the sixties come with the car. The paint is far from perfect, but looks great from a distance and shines nicely. I bought this car from a gentleman that aquired it from an 84 year old gentleman in Nevada where it had spent most of it’s life. Prior to that it was in Southern California. He had owned it since the late sixties and has every reciept for all of those years. This car has never had a hint of rust anywhere, having spent it’s life in the dry Southwest. It has, however, had the drivers fender and door replaced with used parts, probably over 40 years ago, and they could use a little work to be perfect. The motor was rebuilt about 20K miles ago and just purrs like only an old Ford Y-block can. The 3 speed overdrive works very nicely also. This is not a show car, but a car that you could drive every day. It cruises down the highway 70 mph+ effortlessly with the overdrive, and is a pure joy to drive. I love the sound of the dual exhaust coming out of the bumper right behind your ear. Everything works as it should. This car can be enjoyed like it is or would be a great candidate for a high dollar restoration, or just a paint job. $19900 and you can drive it home no matter where you live. I’ll pick you up at the airport.